NO PURCHASE OR PAYMENT OF ANY KIND NECESSARY TO ENTER CONTEST OR TO WIN ANY OF THE PRIZES TO BE AWARDED. A PURCHASE WILL NOT INCREASE YOUR CHANCE OF WINNING. VOID WHERE PROHIBITED. ELIGIBILITY: (a) Persons eligible. To enter the contest and to be eligible to win, an entrant must comply with the terms and conditions of these official rules. (b) Persons ineligible. In addition to those persons who do not meet the eligibility requirements stated above, persons in any of the following categories are NOT eligible to enter the contest or win a prize (defined below): (a) any person who is a shareholder, member, director, manager officer, employee, agent, representative or contractor of MidWest Outdoors, or its subsidiaries or affiliates; (b) any person engaged in the administration, development, execution, management or production of the contest for and on behalf of the Sponsor; (c) immediate family members (defined as a biological or step mother, father, sister, brother, daughter, son or dependent or spouse of any of the aforementioned) of any person in any of the preceding categories, regardless of where they live; (d) persons who reside in the same household (defined as persons living in the same household for at least 3 of the 12 months preceding the start of the contest period, whether related or not) with any person in any of the preceding categories. To enter the contest, do the following: (a) visit the contest website page (b) complete the contest entry form. One winner selected on each month. Prizes will be awarded after email confirmation. Entries limited to one per contest participant per monthly contest; all entries must be received during the contest period. MidWest Outdoors is not responsible for undelivered, illegible or incomplete entries, and reserves the right to remove the contest entries at any time and for any reason. SPORTSMANSHIP: If it is determined by MidWest Outdoors that individuals have acted in an unsportsmanlike manner, the individual will be disqualified. This conduct includes but is not limited to: harassing other contestants, using multiple email accounts to enter, harassing MidWest Outdoors employees and contractors. MidWest Outdoors is not obligated in any way to tell entrants how many entries they have in the contest. Nor are they obligated to correspond with any entrants via email, phone or instant message. PRIZES: Prize winner after confirming identity and providing a valid shipping address will have their prize shipped to the location provided. PRIZE WINNER DETERMINATIONS AND CLAIMING PRIZES: (a) Prize winner will be contacted by email with instructions on how to claim his/her prize. In the event that: (i) a prize winner is found to be ineligible; (ii) a prize winner declines to accept a prize; (iii) a prize winner cannot be contacted or found within 48 hours; the prize will be forfeited and, at the Sponsor’s sole discretion, said prize may be awarded to an alternate prize winner. (b) Each prize winner is solely responsible for the following: (i) any federal, state and/or local taxes, including income and withholding taxes associated with receipt of the applicable prize; (ii) any additional costs and expenses associated with prize winner’s receipt of his/her prize, other than what is stated herein, including, but not limited to, gratuities and other personal expenses incurred in the acceptance or use of a prize; and (iii) responsibility for adhering to any prize expiration dates. The prize is non-transferable and no prize substitutions shall be made, unless by the Sponsor, who reserves the right to substitute another prize or prize component of comparable or greater value. CONDITIONS OF ENTRY: (a) By entering, entrants: (i) acknowledge compliance with these official rules including all eligibility requirements; and (ii) agree to be bound by the decisions of the Sponsor and/or the contest judges, made in their sole discretion, which shall be final and binding in all matters relating to this contest. Individuals who have not complied with these official rules are subject to disqualification. (b) By entering, each entrant also consents to the use of his/her name, likeness, image and/or voice by Sponsor and any of its representatives in any publicity, promotions or advertising without further compensation, notification or permission in any and all media now known or herein after developed without territorial or time limitation, except where prohibited by law. 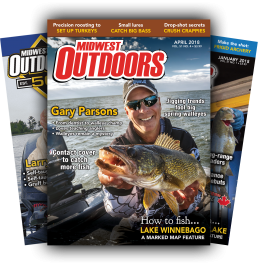 (c) By entering, each entrant also consents to receive regular communications from MidWest Outdoors including but not limited to the MidWest Outdoors eNewsletter. (d) Sponsor is not responsible for late, lost, damaged, stolen, misdirected, mutilated, garbled, illegible or incomplete entries. Proof of transmission (screenshots, etc.) does not constitute proof of delivery. All entries become the property of Sponsor and in no case shall be returned to sender. (d) Sponsor reserves the right to disqualify any entry in the contest or entitlement to a prize, if, in the sole discretion of Sponsor, it determines or suspects that the entrant has attempted to undermine the legitimate operation of the contest by cheating, hacking, deception, or other fraudulent, deceptive or unfair playing practices (including any entries generated by script, macro, robotic, programmed, or any other automated means) and unsportsmanlike behavior (e) If a dispute arises regarding who submitted an entry, the entry will be deemed to be submitted by the authorized account holder of the email address provided at time of entry. Authorized account holder is defined as the natural person who is assigned to an email address by an Internet access provider, online service provider, or other organization responsible for assigning email addresses for the domain associated with the submitted email address. SPECIAL DISQUALIFICATION: If any contestant contacts, harasses, or threatens another contestant, he/she will be disqualified from all MidWest Outdoors contests. DISCLAIMER: This contest is controlled and administered by and through MidWest Outdoors. Entrant acknowledges that the information he/she will provide to enter and participate in the contest will be provided to MidWest Outdoors. SPONSOR: Midwest Outdoors, 111 Shore Drive, Burr Ridge, IL 60527.